Hey Dentist in Waco, How Does a Cavity Develop? Cavities — if you’ve ever had one, you’d probably like to keep it from happening again. When caught early, these small spots of decay are simple to fix. But when ignored, they can lead to far more serious problems, like infection and even extraction. Knowing how cavities develop can help you improve your dental care to prevent future spots of decay. 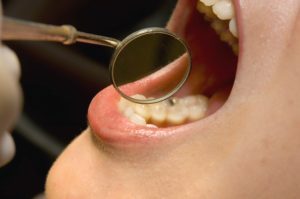 Also called dental caries, cavities are a form of tooth decay. More specifically, they’re small holes in the tooth enamel that occur when plaque isn’t thoroughly removed by good brushing and flossing every day. Certain foods increase the risk for developing cavities. These include carbohydrates — simple sugars — that stick on your teeth. When particles from bread, dried fruits, candy, soda and other sugary substances linger in the mouth, oral bacteria turns these particles into the acids that lead to plaque. And when the plaque isn’t removed every single day, decay is soon to follow. While everyone is vulnerable to cavities, children and older adults are especially at risk for developing tooth decay. For that reason, your dentist may recommend applying dental sealants to a young child’s back teeth, or molars, to protect the chewing surface from cavities. Older patients may require more frequent cleanings and checkups to keep their teeth decay-free. No one wants a cavity — and the good news is that they’re fairly easy to prevent with a good dental hygiene routine. What does that include? Brushing for two minutes, twice a day. Try setting a timer to make sure you’re hitting the two minute mark, or invest in an electric toothbrush that comes with a self-timer. Flossing daily. Make a habit out of flossing by placing the floss somewhere you’re sure to see it every day, like right beside your toothpaste. Don’t consider your evening dental care complete until you’ve flossed. Quitting tobacco. Smoking, chewing, whatever it is, tobacco use of any kind is detrimental to dental and oral health. Kick the habit today for the good of your mouth — and your general well-being. Visiting the dentist as recommended. Twice annual visits to your dentist near Lorena are a crucial aspect of preventive care. When you stay on top of these appointments, the team will remove the plaque and tartar that cause cavities, and check for evidence of early decay. With the latter in mind, when was your last visit to your family dentist in Waco? If it’s been more than six months, you’re overdue — but we won’t tell anyone. Just request your appointment today to benefit from excellent preventive dental care! by: Dr. Rick Cofer at May 20, 2016 . Comments Off on Hey Dentist in Waco, How Does a Cavity Develop?